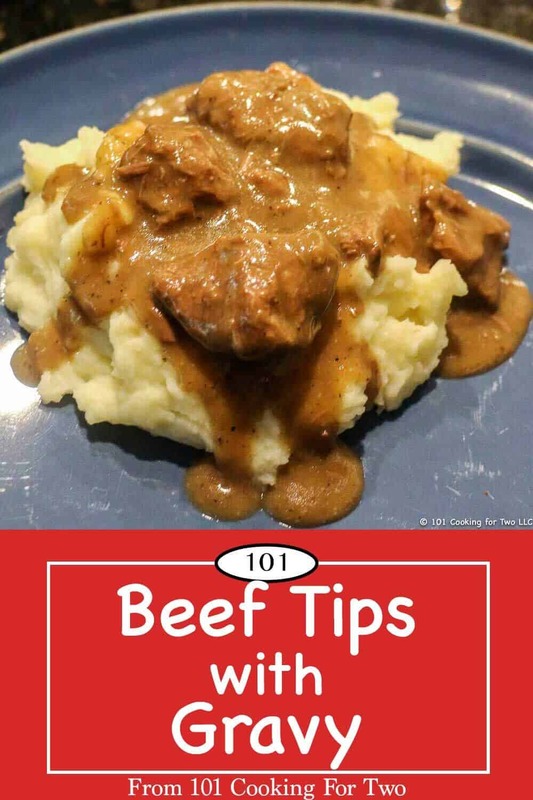 Easy step by step photo instructions for these tender and tasty beef tips with gravy. Guaranteed to become part of your comfort food rotation. Editor’s Note: Originally Published October 15, 2017. Updated with expanded discussion and updated photos. It is comfort food season. And what could be better to warm you and your family then this classic dish? A skill level of about 3/10. This is one of those dishes that both my wife and I grew up eating. But you just don’t see or hear about it much. 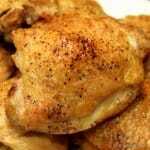 But it is a great family dish that you can easily whip up and have some leftovers too. It is just comfort food, but it is very good comfort food. If you want, a “stew meat” from your local store will work fine. 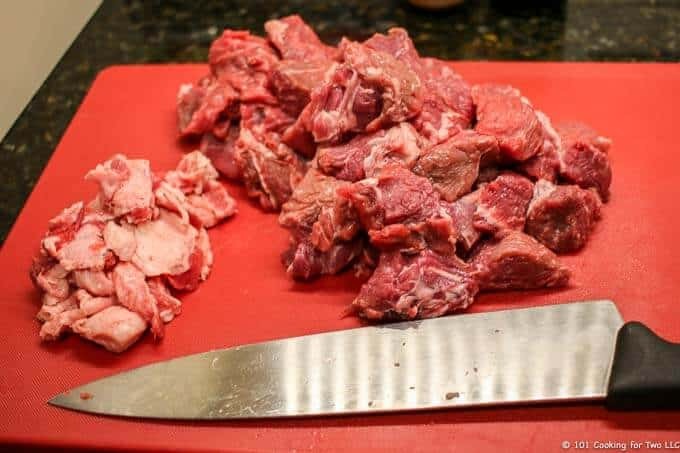 I chose a nicely marbled chuck roast that I could cut and trim myself. I do not suggest leaner meat like a sirloin tip roast even though this dish is frequently called “sirloin tips” but you want more marbling for tender meat. 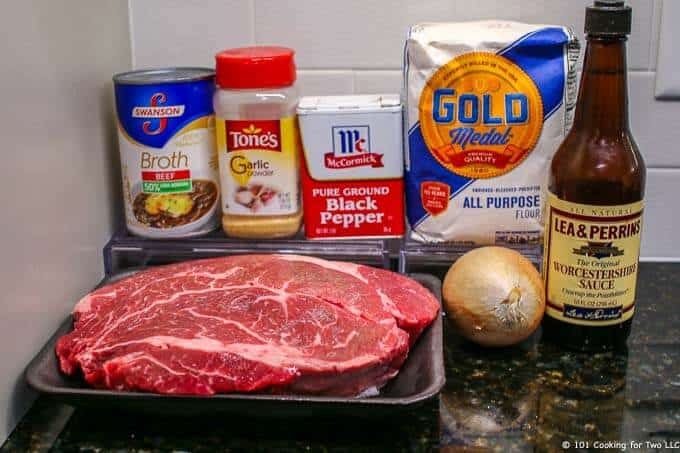 The Worcestershire sauce pumps up the beef taste. Plus you can adjust the garlic to your taste. In my house, my garlic loving wife wants a good strong garlic taste. If you are not big on garlic, then cut it back some. I used a slurry gravy method here, and it was all easily done in one pan. 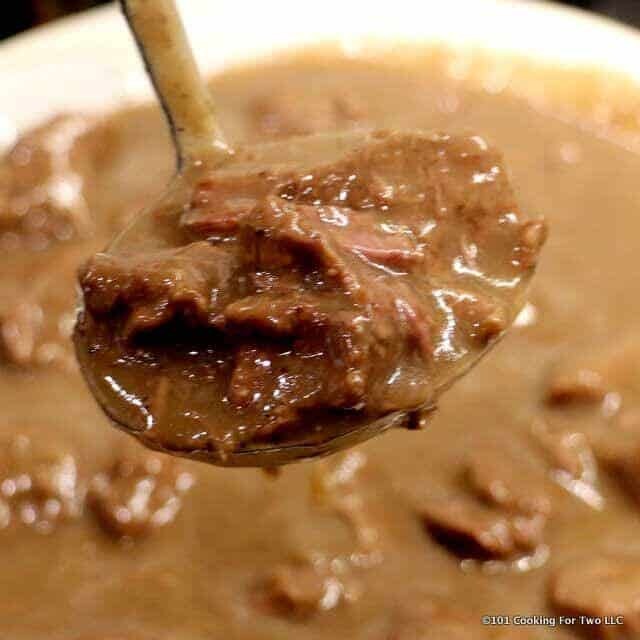 With this method, you can easily adjust the amount thickness of the gravy to your taste. 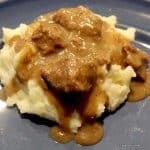 See How To Make Gravy at Home if you want to know more about making gravy. You will not see any added salt here. The Worcestershire sauce and the beef broth add enough sodium here. I would suggest low sodium broth but didn’t have any for the pictures so you will see regular beef broth in the pictures. 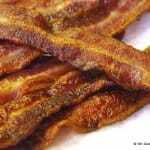 Most of the recipes out there use twice as much Worcestershire sauce plus they usually add soy sauce so the sodium will go sky high. Please do not use corn starch to thicken recipes like this. It is comfort food, and there are usually leftovers. Here I purposely cook for leftovers. Things thickened with cornstarch will be gelatinized when cooled. It tastes ok, but the texture is odd. Good in the refrigerator for 3-4 days. It will freeze well for 3-4 months. An easy recipe to cut in half but I suggest freezing instead. 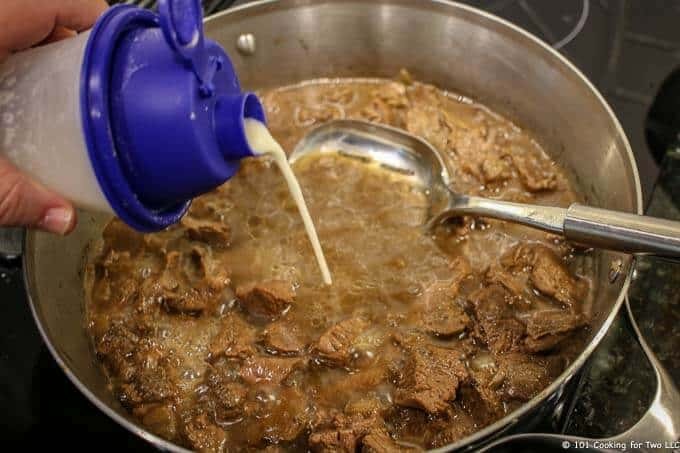 If you cut in half, the cooking time stays the same, and you can use the other half of the can of broth for the gravy instead of water. You will need 2 pounds of stew meat. I like to pick out my own using a chuck roast that is nicely marbled. 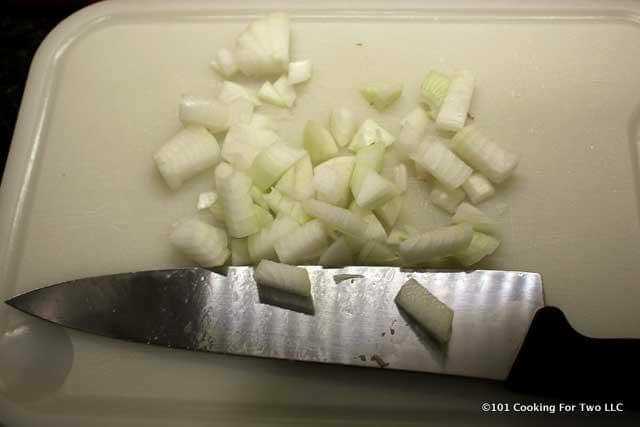 Then trim and cut into 1-inch cubes. 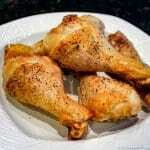 Over high heat, add 2 tablespoons vegetable oil. When shimmering, add onion and beef. Brown the meat for about 10 minutes. Then add 4 tablespoons Worcestershire sauce, 1 teaspoon garlic powder, and 1 teaspoon pepper. Stir occasionally until nicely brown. Add a 14-oz can of low sodium beef broth. Bring to a boil then decrease heat to simmer and cover. After about 90 minutes, the meat should be fork tender. Mix a slurry of 1/2 cup flour with enough water to make 2 cups. Shake to mix using a gravy shaker or whisk until smooth. Uncover and turn the heat back to high. When boiling well, slowly add part of the flour slurry. 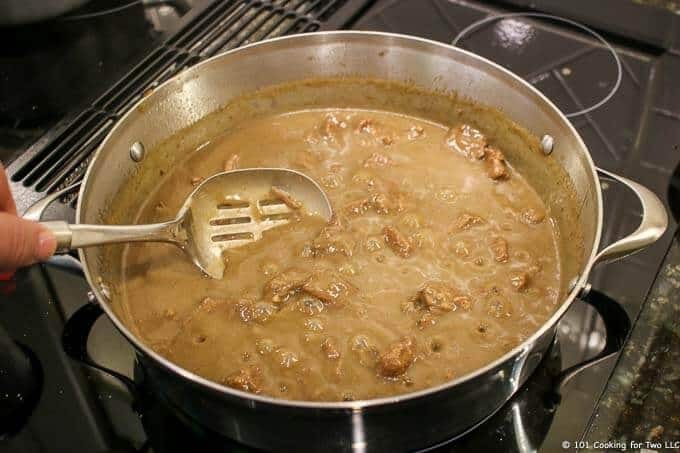 Mix continuously and slowly add more every few minutes until the gravy is your desired thickness. Cook a few more minutes. Server over mashed potatoes or noodles. 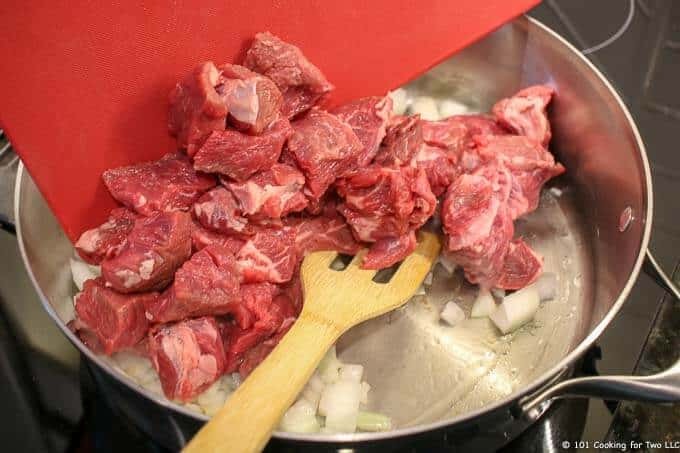 You will need 2 pounds of stew meat. I like to pick out my own using a chuck roast that is nicely marbled. Then trim and cut into 1-inch cubes. 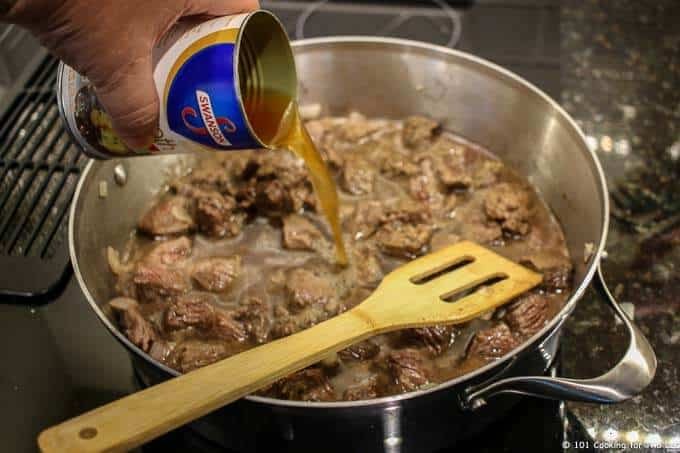 Add a 14-oz can of low sodium beef broth. Bring to a boil then decrease heat to simmer and cover. 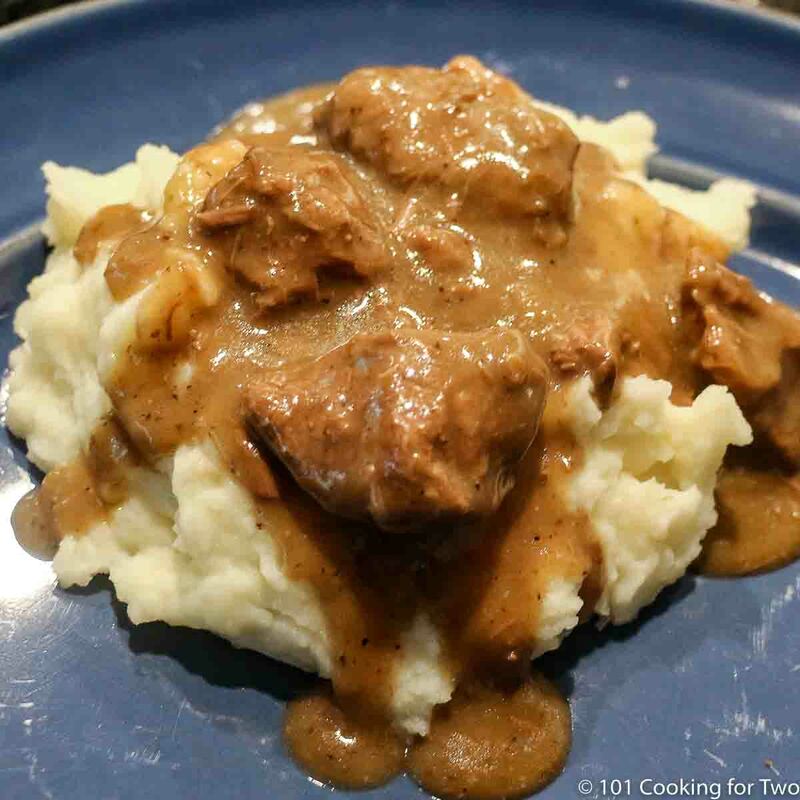 You can use "stew meat" from your local store. I prefer a nicely marbled chuck roast. But leaner beef will not be as tender. Simmer for about 90 minutes covered, but the meat needs to be "fork tender" before going to the gravy stage. Make up a little extra of the flour slurry. Add most of it and add more later if you need thicker. Good in the refrigerator for 3-4 days. Will freeze well for 3-4 months. Removed due to copyright infringement. Hi! Please tell me what to do for 10 minutes in Step 4. Thank you! Sorry for the lack of clarity. It should read “Brown the meat for about 10 minutes. Then add …..” – Fixed. It has been like that for several years. It is what happens when I write directions from memory. I know what I mean but it doesn’t always come through the fingers. Followed the recipe to the T last week (except I use fresh garlic) and I used stew meat. Making again today since my hubby is back in town and I’m using chuck roast I cut up. So excited for my husband to try it! Great recipe! This is one of your Sunday dinner comfort foods for cold days. Glad you liked it. 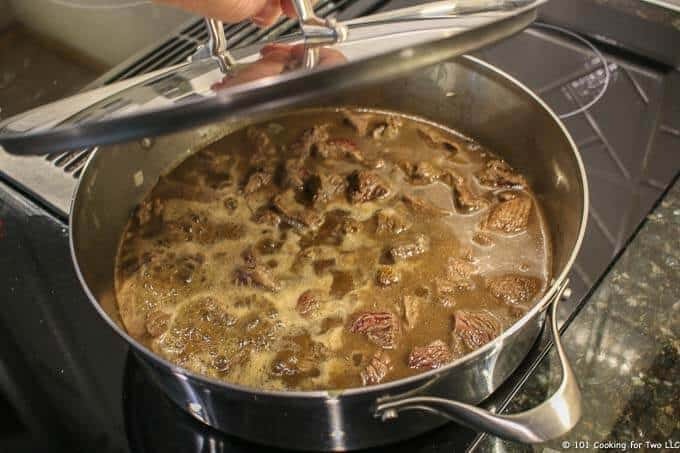 hi my name is Jessica, I have never made beef tips before and I followed your recipe and it was amazing I just want to thank you for being able to to make something so good that was so easy. my boyfriend really liked it so it made me happy so thank you. With that being said I had a wonderful evening because of the meal. Nice easy recipe. Really like the addition of Worcestershire sauce, adds a rich depth of flavor. Great Recipe! Easy to do without a lot of attention being paid to it. I substituted red wine for 1/3 of the beef broth and used two garlic cloves instead of the powder. Thanks for sharing. occasionally made these, but never used worcestershire sauce. made for much better flavor profile – thank you! 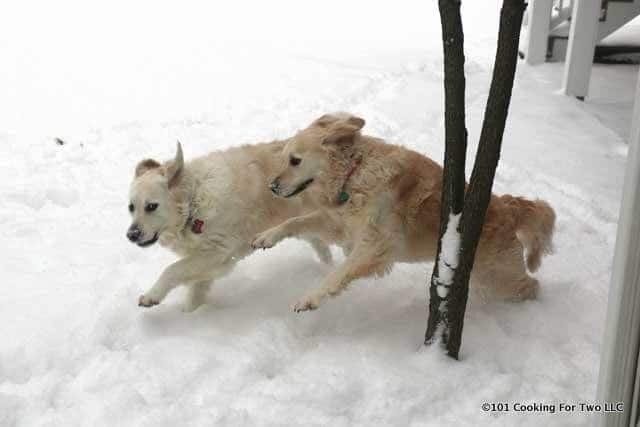 ps: dogs are beautiful and enjoy the updates. Thanks for the note. The Worcestershire does make the “beef” taste pop so I use it frequently for that. Molly and Lilly say thanks also. Really nice on a coolish day! We added 1/2 T sweet paprika as the gravy thickened…tasty.